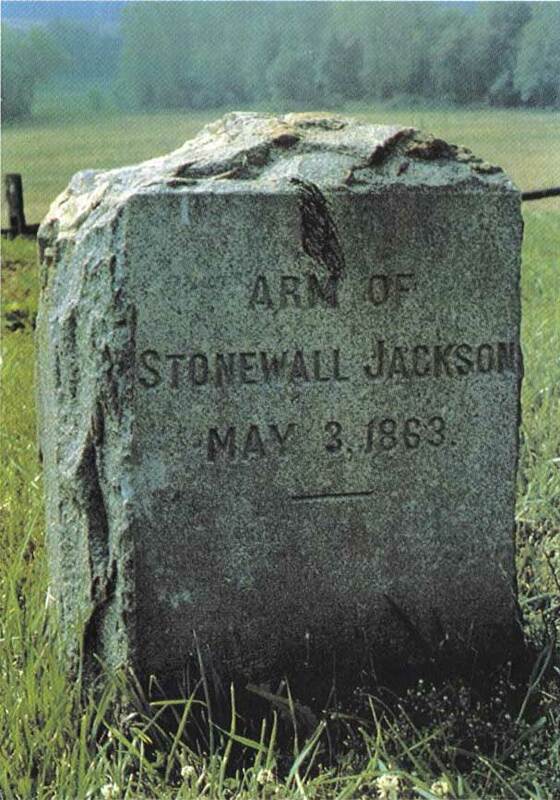 On May 2, 1863 at the Battle of Chancellorsville (American Civil War) Stonewall Jackson was shot. Returning at dusk, Jackson was mistaken for an enemy officer by his own men. They fired a volley, lodging a bullet in his right hand and shattering his left arm. As cannon fire erupted on both sides, stretcher bearers removed him from his advanced position between the lines and placed him in a horse-drawn ambulance wagon which jounced for four miles over rutted roads to the field hospital at the Old Tavern in the Wilderness. Here Stonewall's medical director, 27-year-old Dr. Hunter H. McGuire, deftly removed the ball from his hand and then rapidly amputated Jackson's arm about two inches below the shoulder. Upon learning of Jackson's fate the next morning, General Robert E. Lee lamented, "He has lost his left arm, but I have lost my right." During the day Jackson's arm was respectfully buried about half a mile from the field hospital in the family burial plot of the Lacy family at Ellwood. When Jackson died May 10, 1863, a week after the Battle of Chancellorsville, his body, in accordance with his wishes, was buried 100 miles away in Lexington, Virginia, where he had taught before the war at the Virginia Military Institute.